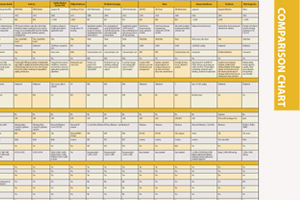 This article originally appeared as an introduction to the Mobile C-arms comparison chart in the April 2016 issue. Now more than ever, thanks to healthcare reform, hospitals and clinics are having to find innovative ways to be flexible with their imaging systems. Even without the threat of reimbursement penalties hanging over their heads, it is not always practical to have multiple dedicated systems scattered throughout the hospital. For orthopedic clinics, surgical units and even some interventional applications, mobile C-arms are providing a low-cost solution. Ziehm Imaging, a prominent player in the mobile C-arm market for years, was recognized with a bronze Stevie for Best New Product or Service of the Year in Health & Pharmaceuticals in the 2015 International Business Awards for the Vision RFD 3-D mobile C-arm. The unit was one of the first on the market — along with Ziehm’s Vision RFD Hybrid — to offer four motorized axes, allowing the surgeon to have total control over movement through a dual-joystick system. Introduced at the 2014 Radiological Society of North America (RSNA) annual meeting and approved by the U.S. Food and Drug Administration (FDA) last April, the Vision RFD 3-D offers other ergonomic improvements, including a three-position memory feature and color coding on the axes to help the surgeon guide the technologist through manual movements. Several vendors have taken the next step and now offer mobile C-arms that can do bi-plane imaging; these are often known as G-arms. One of the newest entries to the market is the MultiScan G-arm system, introduced at RSNA 2015 by Whale Imaging. The MultiScan provides simultaneous live AP/LT fluoroscopy images in the operating room (OR) without having to rotate the machine; it can rotate up to 270 degrees if needed. Motorized mechanics control orbital rotation, height and SID distance for smooth motion and reduced disruption of the sterile field. A console touchscreen and touchpad allow easy image manipulation, patient retrieval and function selection, with numerous anatomic pre-sets included to simplify workflow and improve productivity. Bright HD 19-inch monitors allow easy viewing even in OR lighting. Siemens expanded its Cios mobile C-arm line last year, rolling out the Cios Select and Cios Connect at RSNA 2015. Both models are designed for high-quality imaging in surgical applications but offer slightly different advantages. The Cios Select is geared toward novice operators with an intuitive button-based user interface and positioning system that are designed to minimize necessary training. The Cios Connect focuses on multifunctional usage with an extended free space of 79 cm and immersion depth of 73 cm. Both systems utilize IDEAL (Intelligent Dose Efficiency Algorithm) to provide a clear view of anatomical details at low dose, with a laser-light localizer on the image intensifier and tube allowing radiation-free positioning of the C-arm. The Select and Connect are offshoots of the Cios Alpha mobile C-arm, which received FDA clearance in 2014. Unlike its successors, the Cios Alpha features digital detectors with a 25 kW power output and a field of view the company claims is 25 percent larger than conventional C-arms. The surgeon can fully control the system from one of three touchscreens — one on the C-arm itself, one on the mobile workstation and one on the tableside control. The Cios Alpha also sports vessel overlay software that provides the surgeon with better navigation during vascular procedures. GE Healthcare continues to support its OEC Brivo Plus and OEC Brivo Prime mobile C-arms, both of which received FDA clearance in 2013. The OEC Brivo Prime brings top-notch image quality to mobile C-arms thanks to several features. Smart AutoTrak locates and adjusts the image when the anatomy is not properly centered. Auto SmartMetal is for metal compensation and an Auto Window feature increases brightness and illustrates sharp bone edge. The OEC Brivo Plus is the entry-level version of the OEC Brivo Prime, with the same OEC interface and Smart options, but added point-and-shoot capability. Philips focused on interventional applications with the Veradius Unity, released in 2014. This system marked the switch from image intensifiers to digital detectors. Several navigational aids were incorporated into the system, including the ClearGuide function that correlates directions in the image (up/down/left/right) with physical markers on the detector (3/6/9/12). Operators can use a marker pen with the outline tool to create free format drawings on live fluoroscopy images, including vessel outlines and other anatomical references. Hologic entered the mini mobile C-arm market in 2005 with FDA approval of its Fluoroscan Insight system. Then the company upgraded in 2013 with the Fluoroscan Insight-FD, which uses a rotating flat-panel cesium iodide (CsI) digital detector. The new detector offers distortion-free imaging at a lower radiation dose, with touchscreen controls for image adjustment and system rotation. Productivity is further enhanced by the thin profile and improved workspace access, allowing easy positioning in rooms of any size.